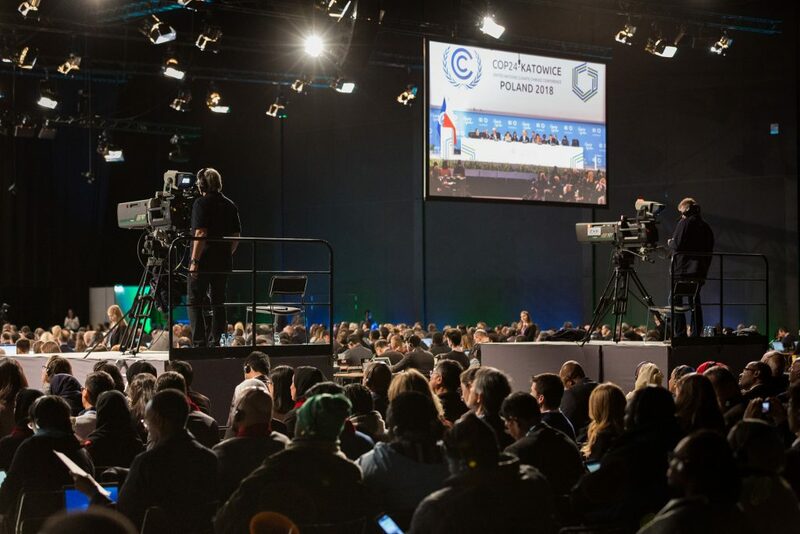 The Government is “sleepwalking” Irish citizens into an unrecognizable and highly dangerous future, the world was told today at the global climate summit in Poland. 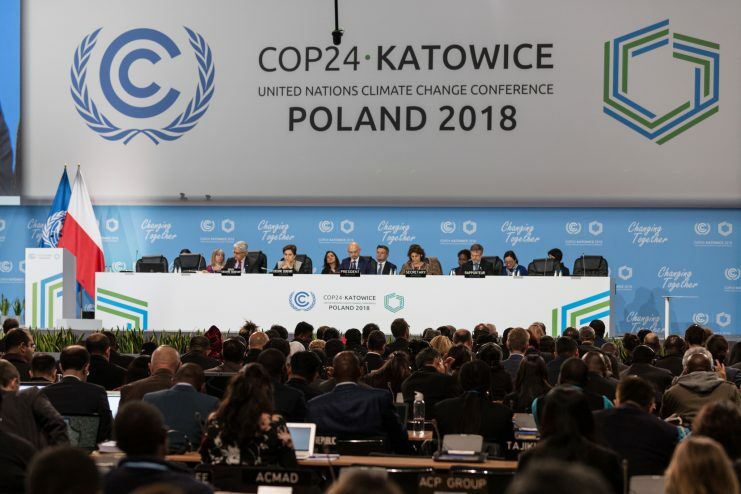 Speaking today at a COP24 session on climate litigation, Clodagh Daly gave the stark warning as she outlined the case brought by Friends of the Irish Environment (FiE) against the State. FIE’s legal challenge claims that the National Mitigation Plan (NMP) —one of the main planks in the Government’s climate change policy—does not do enough to reduce Ireland’s emissions and is a violation of Ireland’s Climate Action and Low Carbon Development Act 2015. FIE also claims that the Plan violates the Irish Constitution and our human rights obligations, and falls far short of the steps required by the Paris Agreement on climate change. The case, set to be heard next January, aims to ensure that the Government deliver the urgent cuts in emissions necessary to avert catastrophic climate change, Ms Daly said. She said that FiE “is not alone” in its criticism of the NMP, with the State’s own climate advisory body finding that the Plan will “not put Ireland on a pathway to a low-carbon transition”. Ms Daly said that while the Irish government has repeatedly endorsed the conclusion of climate scientists that we must rapidly decrease emissions, our emissions continue to rise. “Ireland has the third highest level of carbon emissions per capita in Europe, and they continue to increase,” Ms Daly said, with the government “failing to even come close” to hitting its EU targets. 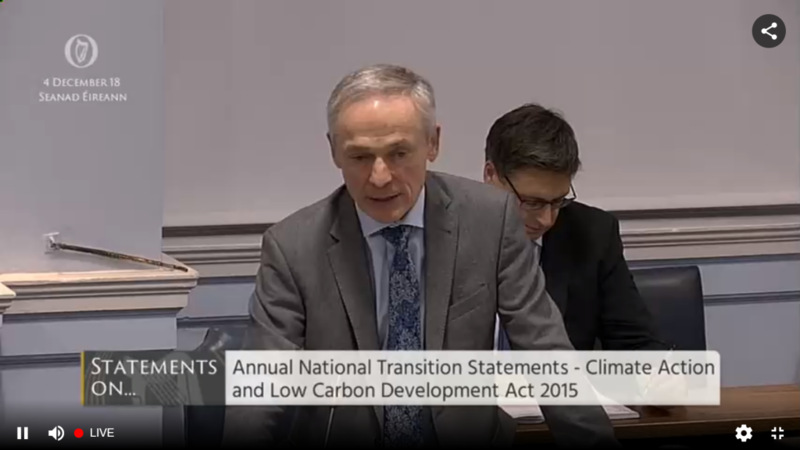 The new Minister for Climate Action, Richard Bruton TD, said yesterday that Ireland needs to step up and do more if we are to achieve our climate targets. Mr Bruton admitted that Ireland will fail to meet its 2020 target of reducing emissions by 20 per cent below 2005 levels. We are only likely to also achieve a one per cent reduction, leaving us 95 per cent off target, Mr Bruton said, adding that he will push Ireland to play a greater role in leading on climate action. Ms Daly said, however, that “actions speak louder than words” and that our leaders are “sleepwalking us into an unrecognizable and highly dangerous world”. “If we are to breathe life into the Paris Agreement, we need to see bold, transformative policies across all sectors of the economy,” she said. The UN’s Special Rapporteur on Human Rights and Environment recently weighed in on the case and concluded that the Irish Government has “clear, positive, and enforceable obligations” to protect against breaches of human rights by climate change. In his landmark statement, Professor David Boyd said that that failure to attenuate climate change amounts to a transgression of human rights. Prof Boyd said that climate change adversely impacts the right to life, a right that the Irish Government is “legally obliged to respect, protect and fulfil”. Prof Boyd concluded that the Irish State has “positive human rights obligations” to lessen the impact of climate change by rapidly reducing its greenhouse gas emissions. “It must reduce emissions as rapidly as possible, applying the maximum available resources. This conclusion follows from the nature of Ireland’s obligations under international human rights law and international environmental law,” he said. There has been a global surge in climate change litigation over the past few years, with an estimated 1,000 live cases worldwide. This includes cases that aim to hold governments directly responsible for climate change, starting with the landmark Urgenda case against the Dutch Government in 2015. In this case, the courts ruled that the Dutch government must now reduce its emissions by 25 per cent by 2020. Just last month, three Germany families filed a case against the government arguing that it is violating their constitutional rights to life and health by failing to take measures to meet its 2020 targets. Earlier this month, a group of young Canadians took legal action against their government for failing to enact ambitious emissions reduction targets. In May, families from across Europe filed a case calling on EU institutions to recognise climate change as a real threat to human rights and to strengthen laws to reduce emissions. The case of 21 young people who filed a landmark case in 2015 against the US federal government seeking comprehensive measures for ‘climate recovery’ may come before the courts in 2019. The lawsuit demands that the US government adopts a national plan to lead to a drop in atmospheric concentrations of CO2 to the recommended safe levels of 350 parts per million (ppm) by 2100. The lawsuit argues that despite acknowledging the role of CO2 in causing climate change as far back as the 1960s, the government has failed to implement policies to adequately reduce emissions levels. Judgment is also expected next year in a case brought by over 1,000 senior Swiss women to protect their right to live in a healthy environment. The group argues that Swiss climate goals are insufficient to protect elderly citizens and that measures taken up to this point are not good enough to battle climate change.